I needed a pick me up. I was in the middle of a 23+ hour journey home consisting of three flights, multiple layovers and delays, and first trimester hormones and exhaustion. This book was exactly what I needed. Nina is sweet and snarky and completely lost. Her career has been her life and now her library no longer wants her. So, she decides to reinvent herself and move up to the middle of nowhere to make a go at being her own bookseller. Along the way, there are mishaps and misunderstandings, best friends and romance, comedy and empathy. 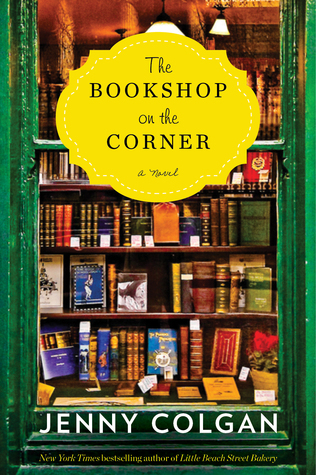 The Bookshop on the Corner is a sweet read, full of generosity and kindness. It will make you laugh and make you cry. Women’s Fiction sometimes gets a bad rap. People say it’s fluffy or silly. The Bookshop on the Corner is neither of these things. It is smart, kind, challenges stereotypes, celebrates community and friendship, and tackles issues like poverty, competition, divorce, discrimination, first impressions, adultery, anger, fear, and sadness. Jenny Colgan’s The Bookshop on the Corner is a delightful, comforting read. It gently spurs you to think while also giving exactly the feel-good read you need in rainy weather or tough times. I’m planning on reading anything else by Jenny Colgan that I can get my hands on. Lol I caught that too! I suppose because it’s mobile it could sometimes have been parked on a corner?